At Oliver Wight, we often see that those organisations that enjoy a successful IBP process, also integrate their finance community in a similar way. One of the most common attributes in these businesses is that finance has been reinvented from its traditional role as ‘a recorder of financial information’ to one of ‘finance business partnering’. This enables finance to become tightly incorporated into the IBP process, allowing the department to become highly involved in crucial decision-making processes, which substantially improves business opportunities. So much so that the Finance Business Partner has become a vital role in market-leading organisations, as well as a major enabler of successful IBP. There are, of course, many ways that finance can be structured within an organisation. 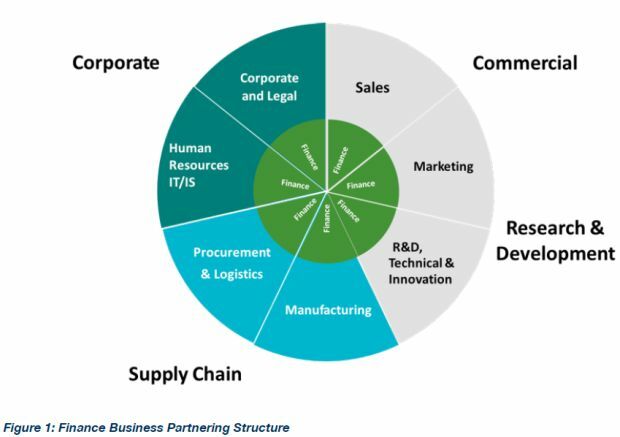 However, having finance people embedded within the different departments of the company is an extremely useful model to follow, as shown in the structure in Figure 1., used by an Oliver Wight client. A key advantage of this structure is that although the finance people still have the finance department as their home base, they are highly involved in individual departments, with their guidance sought day-to-day, by team members. They become more familiar with the detail of what is going on in the business and not seen simply as ‘the bean-counter’, who visits periodically and is often just a distraction for the rest of the team. This model has become more common during recent years, whether the organisation has moved to an IBP model or not. 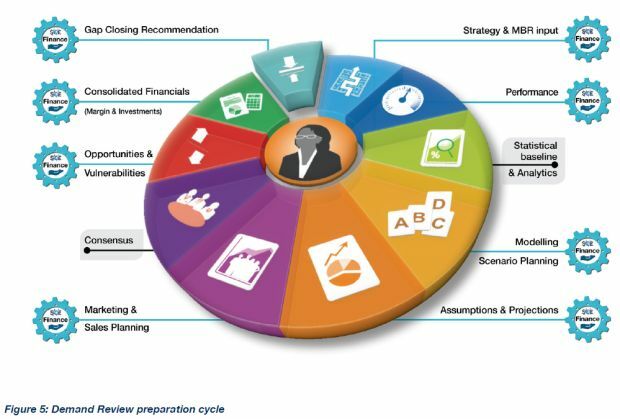 In any case, it is a great structure from which to build the finance roles that will make IBP work most effectively. The CFO at a leading company describes the core roles of finance in IBP as being ‘collaborator’, ‘enabler’ and ‘custodian’ (Figure 2.). 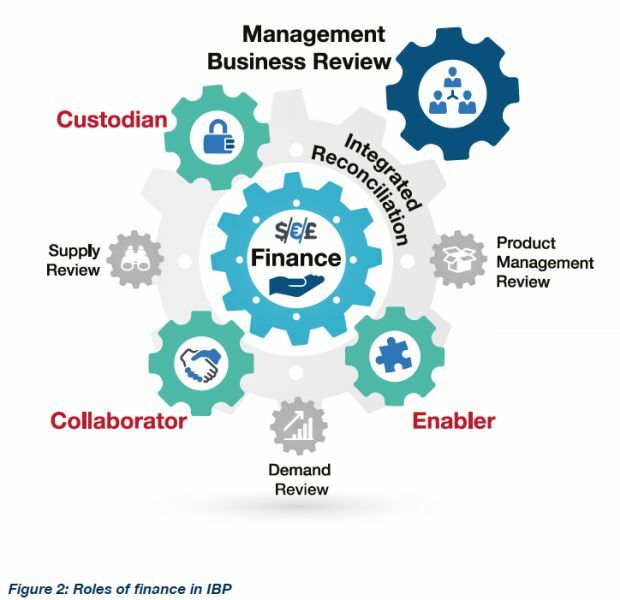 Finance collaborates with its business partners and process facilitators through the different elements of the IBP process to help develop and critique assumptions and translate these into financial terms. As an enabler, finance ensures that all the financial implications are explored and understood, and built into the recommendations that lead to decisions being made within the IBP process. As custodian, finance safeguards the integrity of the financial projections, making sure forecasts are credible, business cases are robust, performance measures are accurately reported and gaps to commitments are made visible and are understood across the planning horizon. It also ensures that the drivers for the 24-month financial forecast are correctly captured, including volume, sales, trade spending, costs and capital expenditure plans. Be ‘roughly right’ rather than ‘precisely wrong’. She encourages her team to focus on the things that make the difference, rather than spending time trying for perfection before they act. This may be a culture change for some, who perhaps have been more used to a high degree of precision in reporting. However, it is important to note that IBP is about the future and is based on assumptions. As such, nothing can be precise, only directional. Insist on one set of numbers to run the business, with finance driving the integrity of the financial projections. This means all areas of the business use the same ‘source numbers’ and questions are managed through the monthly IBP cycle, rather than off-line or in separate forums. IBP review meetings should be action oriented, not discovery sessions. Key assumptions supporting each part of the plan need to be understood, any changes from previously agreed plans acknowledged, and the implications of these changes identified. Finally, action plans need to be agreed to support the business over a 24-month horizon. A few years ago, Oliver Wight developed the concept of the ‘Five Key IBP Questions’ – simple ‘must-haves’ that can be applied in any organisation and that can be used in each of the IBP review meetings to ensure they address the key issues facing the business in a standardised way, so plans can be validated and the necessary decisions made. The finance team has a vital role to play in answering these five questions. Senior leaders chairing the key IBP review meetings need to see information being presented in a business-like and commercial way, and this information needs to be ‘decision-grade’. The Finance Business Partner helps by ensuring that the financial implications of the five questions are properly presented, in a consistent and easily digestible fashion. Oliver Wight recommends that finance is included as a key participant in each of the review steps. It is important to define what role finance will play both in the lead-up to the meeting as well as in the meeting itself. To understand how this works, it is worth unravelling the process and looking at the specific role that finance should play in each process element. 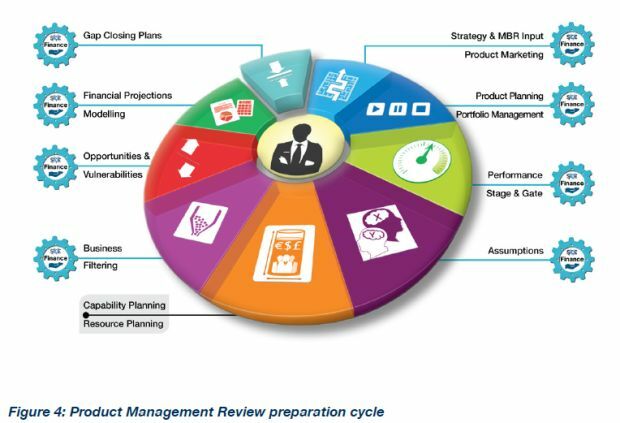 For those companies that have adopted a Finance Business Partnering model, the Commercial FBP is likely to be the finance team member at the Product Management Review (PMR). A typical preparation cycle for the PMR is shown in Figure 4. The commercial Financial Business Partner ensures that any financial information concerning planned changes to the portfolio (e.g. product rationalisations, cost reductions, product changes) have been properly incorporated. Updated information is based on any changes to portfolio plans since the last IBP cycle. The horizon for the product and portfolio plan must be a minimum of 24 months. In many companies, this horizon is considerably longer, and may be 36 or even 48 months depending on lead times for product innovation and development. Working with the Product Planning Manager (the facilitator of the PMR), finance ensures the resultant financial forecast has the correct assumptions, such as attrition through the funnel, which projects to include at which stage in the funnel, and ramp-up after launch. The Financial Business Partner also ensures that any financial measures being reported in the meeting (such as the percentage of sales from new products) are correctly captured and reported. Any financial updates to new product projects are also properly evaluated and included in the assumptions. These are drawn from latest information provided to the stage and gate process and from an understanding of recent performance of newly launched products. Within the stage and gate process itself, the Commercial FBP provides the financial support to development projects including net sales value, contribution, return on investment capital and so on. For each of the projects, they also provide a critique to assumptions and ensure that these are based on credible information. At the same time, Opportunities and Vulnerabilities are fleshed out, and financial implications understood. For the PMR, Vulnerabilities and Opportunities are likely to arise from such circumstances as delays in a project, or the potential to bring a project forward. The Commercial Financial Business Partner ensures that the financial implications and impact on the business (the revenue and margin in particular) are understood. Decisions need to be made at the PMR, and potentially at other points in the cycle, so reliable information supporting those decisions is required. Depending on how finance is structured, it is likely that the Commercial Finance Business Partner also supports the Demand Review. The monthly demand review process will have been mapped out to describe in detail the various steps that are required to make the Demand Review successful. This includes all the activities that involve finance. Figure 5. illustrates the key steps in a typical demand preparation cycle. Finance is involved in many of these steps. Early in the month, reliable financial measures are captured and reports assembled. It is not simply a case of reporting the numbers. Rather, finance provides the analysis behind the numbers. 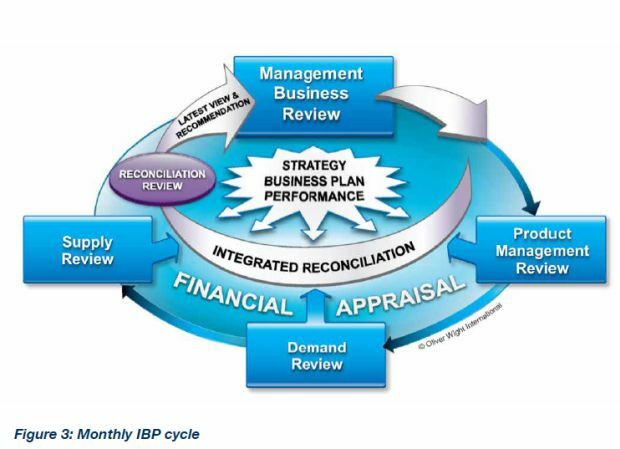 How does the financial performance relate to the plans that were reviewed and approved in the previous IBP cycle? Which assumptions were proved wrong? This requires close coordination with the demand team to ensure that evaluation of the financial measures lines up with root cause analysis on measures such as aggregate demand plan performance and forecast accuracy. Ultimately, there should not be two conflicting stories here. The consensus process often includes pre-meetings such as Category Team meetings or Pre-Demand Reviews. Finance also supports these. In larger companies, it is possible that Commercial Finance support consists of a team reporting to the Commercial Financial Business Partner. In this case, its various team members support the pre-Demand Review activities and attend associated pre-meetings. Opportunities and Vulnerabilities for demand are fleshed out and the financial implications determined. This should not simply be a case of finance listing all the Opportunities and Vulnerabilities, applying some sort of probability, adding them up and netting them off, as we have seen in some companies – this makes no sense. Finance must help sort through the various Opportunities and Vulnerabilities that arise and ensure that the focus is on the significant items identified. The objective is to find ways to exploit Opportunities and defend Vulnerabilities – not simply make a long list that is impossible to manage. Finance consolidates all the inputs that have been received, critiqued and analysed and identifies gaps to financial commitments – this year’s budget, next year’s targets and further out over the company’s planning horizon. However, simply identifying the gaps is not enough. Finance must support the production of gap-closing recommendations with robust financial information. These form a key part of the agenda for the Demand Review itself. Where finance business partnering is in place, the Operations or Supply Chain FBP supports the Supply Review and its associated process. As with Commercial Finance, there is often a team in this area, especially where there are multiple manufacturing facilities. Again, the Supply Review process will have been mapped out with all inputs, outputs, roles and responsibilities identified, and shown in Figure 6. Where there are multiple manufacturing sites and/or more complex supply chains, the Supply Review process is typically broken up into Supply Point Reviews as well as an overall Supply Chain Review. In this case, various FBP team members support the Supply Point Reviews as required. The finance team provides reliable financial measures as part of the overall set of performance measures for supply. This typically occurs quite early in the month. As with all performance measures, there is appropriate root cause analysis to understand which assumptions in the plan were not met. Finance also plays a part in scenario modelling for alternative supply plans, ensuring the financial implications are clear. Opportunities and Vulnerabilities are captured and financialised as appropriate, again focusing on the important few rather than the trivial many. Financial projections are developed so the financial outcome of the supply plan is understood; this includes material and labour costs, inventory, overhead recovery, plant performance and capital plans. Financial analysis is required for decision briefs, dealing with issues such as capacity, shift changes, pre-stocking and alternative sourcing models. Gaps to commitments are identified with gap closing plans proposed and the FBP monitors the profit improvement plans in the operations and supply functions. All of this comes together so recommendations can be reviewed and decisions made with confidence in full knowledge of the financial implications. Integrated Reconciliation and Optimisation is a continuous monthly process lead by the IBP Process Leader and the facilitators for each of the three core process elements of IBP (Product Planning Manager, Demand Manager, Supply Chain Planning Manager) work as a team to ensure issues are captured and moved through the IBP process effectively. Here, finance works hand in hand with the IBP Leader and process facilitators to make sure that financial implications are clear and the financial picture builds accurately through the month. This is shown in Figure 7. Leading up to the Reconciliation Review finance pulls together the financial picture for the company ensuring the forecast reflects the metrics and assumptions from each of the three preceding reviews. So, the full ‘Gap to Commitments’ analysis is brought together for current and future fiscal years. Finance ensures that scenarios and alternative plans for presentation at the Management Business Review have the appropriate level of analysis for decision making by the executive team. In many organisations, the finance team holds a Finance Review meeting leading up to the Reconciliation Review to ensure the financial metrics are well understood and projections robust. This is where the FBPs from across the organisation come together in a meeting chaired by the CFO. In some organisations, the CFO may also chair the Reconciliation Review, which is attended by the process facilitators and all the FBPs. The purpose is to identify the decisions required for the Management Business Review and ensure that alternative plans and recommendations have been prepared and are ready for consideration. The focus is on understanding the current state of the business and having gap closing recommendations on the table for decision. As an organisation matures, the focus shifts from gap-closing to re-planning and re-optimising the business. With more robust assumptions and plans, the company can now drive to aspirational targets with better balanced Opportunities and Vulnerabilities. As a member of the executive team, the CFO attends the MBR. The CFO is the process owner for the financial appraisal component of the entire IBP process and in some companies also acts as the executive owner for Integrated Reconciliation. The CFO ensures that all financial plans have been properly evaluated. They may be the custodian of the business scorecard and will certainly provide the key financial metrics for the MBR (such as EBIT, ROIC performance and projections). The CFO ensures that decision briefs are in place for the MBR to enable gap closing decisions, and that appropriate scenarios have been modelled for key Opportunities and Vulnerabilities. The CFO also helps the executive team understand what is at risk. All of this ensures the MBR is a forum for executive decision-making. The focus is on driving the business to meet its goals and closing gaps to commitments, with the financial implications clearly understood. More mature organisations use the MBR to drive the organisation to aspirational targets using balanced Opportunities and Vulnerabilities as the levers, and built on quality assumptions and robust financial information. 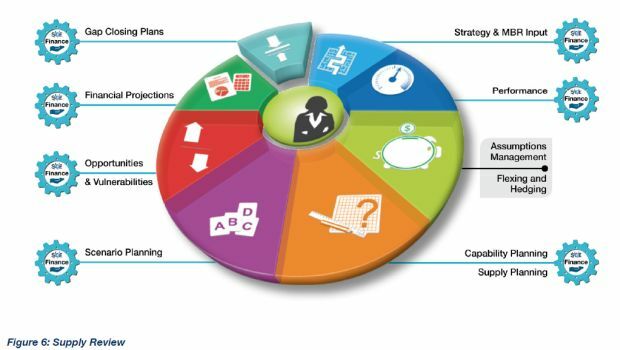 A key differentiator of Integrated Business Planning from S&OP is the inclusion of more robust financials. 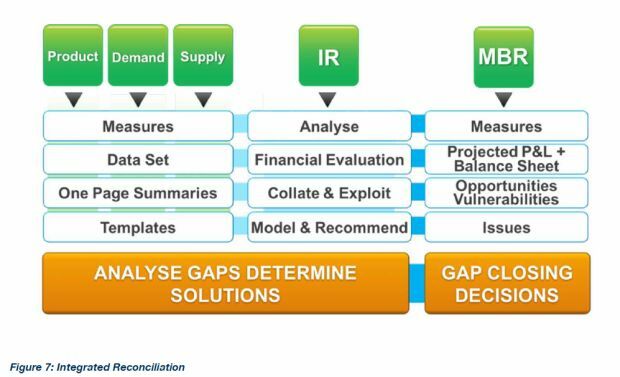 This delivers much greater value to the company providing a company-wide focus on gap-identification and gap closure and maturing to continuous re-planning and re-optimisation. To achieve this, the finance community in the organisation needs to play a significant role in the IBP process. It may take a change in culture, moving from ‘keeping the score’ to a much more active role in driving the business. The financial forecast is taken from the same place as all other forecasts – one source of the truth. Properly done, this drives ownership of the numbers by the business, which begins to consistently deliver to forecast, month-in, month-out. The central role of finance in IBP is to provide a vital business partnership, enabling visibility and accountability for the financial outcome. Finance is pivotal in the development of successful IBP in all areas of the business. It must move to challenge and support the organisation and act as an enabler rather than compliance police. In this way, finance becomes part of leading the business not only in day-to-day activity but by engaging in commercial strategies and solutions that drive better results. Mike Reed is partner at Oliver Wight Asia Pacific. For more information call +61 3 9596 5830, email information@oliverwight-ap.com or visit www.oliverwight-ap.com.